While we can get them in a thicker, heavier weight index stock, that would be a custom created tab run that can take 10-15 working days for the production lead time. 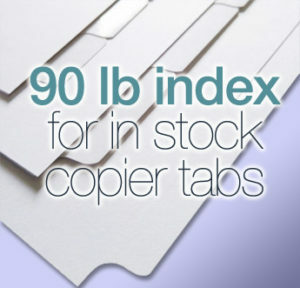 The copier tab dividers that are in stock/ready to ship are all in the 90 lb index weight. So if you you you want them to ship soon, going with the stock 90 lb tabs is the way to go. If you you you can wait and really must have that 110 lb index or even a different color other than white, contact us for a quote on a custom tab order. Do you you you have any tab divider formats you’d like us to carry? Please let us know in the comments below. 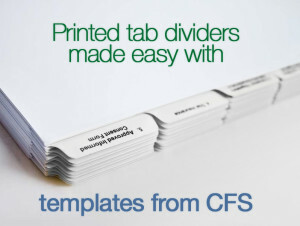 Did you know that you can create your own custom imprinted copier tab dividers? Putting any wording, numbers, etc. on your copier tab dividers is easier than you think and doesn’t take a trained graphic designer or expensive software to precisely align text to exact measurements for the 1/2″ tab extensions. It’s actually a breeze when you use our Copier Tab Templates that are available for download from our website. These templates are nothing complicated. They are simply Adobe Acrobat PDF files that you fill out like a form with a spot for each of the tab positions. There’s even instructions on the templates for changing the fonts. Only the type you input prints, everything else is hidden during the final printing. Our templates are available for all of our stock cuts in 3, 4, 5, 6, 8 and 10 bank configurations. Give them a try, we think you’ll find them extremely easy! Of course, if you don’t see the exact tabs you’re looking for just let us know. We can get you a quote for nearly any custom tab design, size and paper stock. 2 Minute Tuesday: Where Will My Items Ship From? The other day I purchased a book from a large internet retailer. Almost immediately after placing my order, I received a confirmation – but nowhere in the confirmation did it say where my item would ship from, so I had no idea when to expect it. Much to my surprise, my item arrived the next day, apparently out of a warehouse that was only 100 miles from my home. Obviously, this company utilizes warehouses all around the country. And at CFS, we do the same thing. So even though our sales offices are in California and Michigan, that doesn’t necessarily mean that’s where your order will ship from. We supply a wide variety of products, so it’s inevitable that our items will ship from multiple distribution points. So let me give you some general information that will help you to get a better understanding of when your order will arrive. First of all, most orders ship the SAME DAY when the order is placed before 2:00PM PST. Of course, exceptions can always be made, so if it’s after 2:00PM and you need a rush order, just give us a call. We can probably still accommodate you! Now sometimes one particular warehouse may be out of stock and we have to ship from an alternate location. When this happens, we do our best to inform you of the potential delay. And if you need to confirm that an item will ship from a specific location, just put a note on your order in the Special Instructions/Comments field during checkout and we’ll be sure to get back to you. We strive to bring our customers the best selection of products at the best price, but we also want you to get your items quickly. Rest assured that we treat each and every order with the care and attention that you deserve! Do you have any tips on how we can improve our ordering/shipping processes? We’d love to hear your comments. 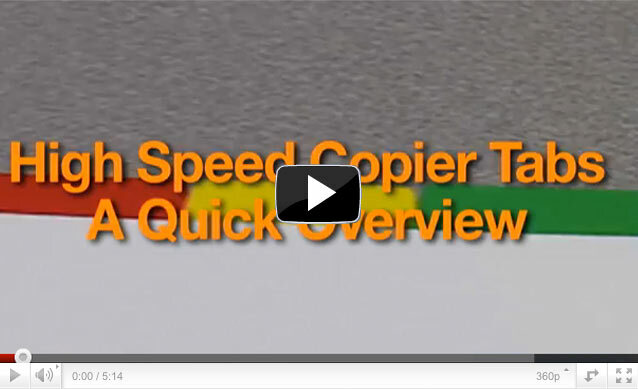 Joe’s Question Corner: Will The Copier Tabs Work In My Laser or Ink Jet Printer? Do you have any tips for getting the tabs through your copiers? Our tabs are made from 90 pound recycled bright white card stock that has moderate rigidity. All tabs extend ½” beyond the 8 ½ x 11 inch base sheet. All tabs can be ordered plain or coated with a clear printable mylar. Additionally, for fifth cut tabs only: rainbow colored tabs are available as are all solid colors in all green, red and blue. 3 hole punch options are available at no extra charge. Third cut tabs feature 3 tabs at 3.33 inches wide. Fourth cut tabs have 4 2.5 inches tabs. Five position tabs are 2 inches wide. Individual tab positions are also available in packs of 250 each. Eighth cut tabs have eight 1.25 inch wide tabs. And ten position tabs are 1 inch wide. Is there a special use for copier tabs that you have? Let us know in the comments below and we’ll see what we can do for you.